And never pick them up that way again." I have become such a crybaby lately. I just cry at the drop of a hat ... like right now for example. But yesterday morning I ran across a short piece on Facebook called "The Last Time" that has kind of done me in. The last time. People say things like, always part with someone you love like it will be the last time you see them because you never know when that will be true. The Lord only knows I am aware of that one. And like it, do good for those you love, because you never know when the chance to do good will not come again. My mother has been gone for ten years, but as much as I may have done for her, I have never ceased counting on my fingers all the more things I could have done for her, as well as all the times I may have disappointed her. The last few days I have had Michaela's last night with me playing itself over and over in my head, how I woke in the middle of the night feeling cramped and crowded, and reached out my hand and identified the cause as Michaela by running my fingers through her hair. I don't know how, but almost 27 years later the tactile memory is still fresh, and in my fingers I can feel the texture of her hair, slightly tangled from sleep. I can feel the contours of her skull beneath my hand. And I am so so filled with longing to feel it again. Oh Lord, it is funny, isn't it? The little things that cause us to become undone. Well, at least that didn't turn into one of my regrets, as I chose to let her stay that night, to give her that comfort from her fears in the night, that one last time. 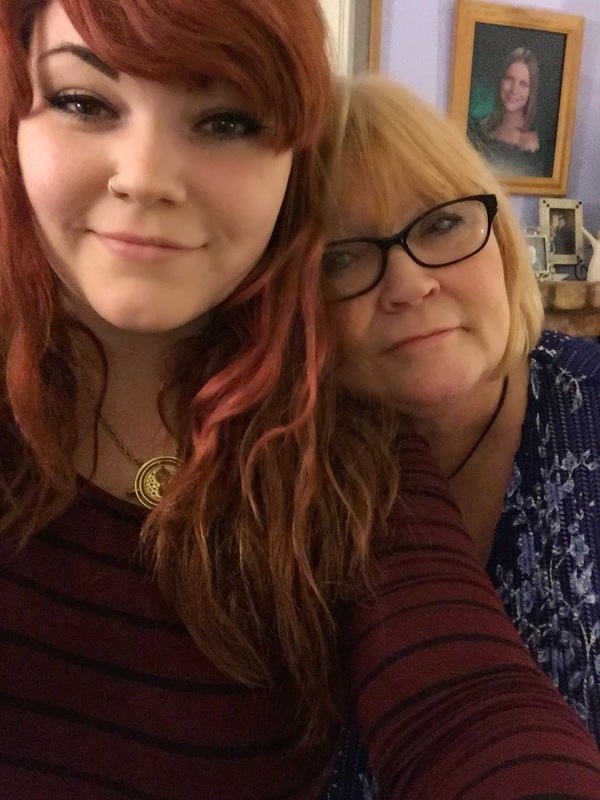 Whenever I publicly show signs of sadness in blogs, or on Facebook or other social media, all those people who just kind of know me assume that it is because of Michaela. That is enough sorrow to last a lifetime, for certain, and it would only be fair that having been served that full allotment that the rest of my life would be carefree. But alas, that is not the case. I have given birth to five children, plus one stepdaughter, and the fact is that where there is great love, there is potential for great sorrow. With children this is particularly true, because their sorrows are my sorrows. I feel it like a knife in my heart when their hearts are hurting. And I have my own private sorrows as well, some of which just float free, nameless, origins unknown, destinations unknown. Perhaps reading this poem just nailed some of them down, gave them names and places of birth, as I realized the continuous experience of loss that is our lives. My children are all young adults now, and as of next week all but one of them will be gone from my house. The two oldest are actually hundreds of miles away. How did that happen? I am suffering from empty nest, and yet I am not. It's been a long, slow process, and for the most part I am ready for it now. My youngest daughter was my best friend for a long time, but then she went and got a new best friend and I was like, oh, maybe I will need to make a life of my own, and I gradually became more, well, independent. I used to plug in my headphones and call her on my break at work. Now I plug in my headphones and listen to a book. At this point, I am okay with life becoming more quiet and orderly and less of the chaos of a large family and lots of people coming and going all the time. I actually like solitude. I grew up an only child in a military family where we were always moving to new places where I knew nobody. I really had no family in the United States except my parents, and now they are gone I have only my children. That is probably why I had so many of them, and yet it was really to no avail. Perhaps it was just fighting against my nature, my destiny, to be solitary. Today is Easter. It is a family holiday, and yet I am alone. Circumstances just arranged themselves that way. Most of my kids could not be here because of distance or work. One is with her boyfriend's family, which after three years together is her family as well, where they have huge family gatherings for holidays. And I really don't mind it. I don't mind being alone. Honestly. In a little while, I will probably put on some music and clean, and that will actually make me happy. I will probably even dance while I clean! But for right now, for this moment, I just have to sit here for a bit and cry. It's not a bad thing, all this blubbering and boo-hooing I am doing these days. I have lifetimes of grief built up inside me that I have pushed down, hidden away, denied. I have distracted myself with people and busy-ness, I have hardened my heart, I have taken antidepressants. I just rid myself of those a few weeks ago, and perhaps that is why I am feeling so many feels, as my youngest daughter would put it. But it's okay. It is something I need to be able to do. If you have been washed up on the far shore by the storms in your life, you have got to swim the ocean if you ever want to get home. But this morning, I am feeling not only the big losses -- Michaela, my mother -- and the medium losses, children growing up and leaving physically and/or emotionally. I am feeling all the small losses that could never have been grieved at the time because I never even knew they were happening. When, exactly, was the last time I held my child, put her down, and then never picked her up again??? And why does the knowledge that there was such a time fill me with such ever loving grief? I picked her up, put her down, and never ever picked her up again??? Five times over this happened, with each child. I might be forgiven for not noticing with the older children because my arms were always filled with another one, but with my youngest they were just empty, and I never knew. When my children were babies, I was always being warned that I would regret how I was raising them. I just simply loved them. When they cried, I held them. I never, ever once in all the years with five babies left any one of them to cry themselves to sleep, however many people told me I had to do that. And you know what? They were all okay. They are a varied lot, my kids, but they have turned out to be really wonderful, loving human beings, and every single one of them goes to sleep at night without me. When was the last time I held one of my children until he or she fell asleep and laid them carefully in their beds so as not to wake them? Lifetimes ago, when we were other people. I have to admit the Taylor Swift song "Last Kiss" has always laid me out. I have lost a lot of mascara over that song. And what always got to me was the notion of a last kiss, and the fact that when that kiss happens, you have no idea that is what it is. If there is a theme that runs through my writing, it is that love = loss. Most people are not aware of that when they enter into love. They run giddily into the field of flowers, blissfully unaware of the fact that a hole can open up underneath them without warning, and they can fall into it. Those of us who have experienced a devastating loss, we know. Some of us avoid it, but for all of us, love is so much more, deeper, so much more precious (precious in its literal meaning, which is costly but of great worth). My youngest daughter was born with this knowledge, because she had the great privilege of experiencing my own deep grief throughout my pregnancy. I say "privilege" with tongue in cheek, and yet not, because as heavy a burden as this is to carry for anyone, much less one so young, it really is a gift to know in your heart how precious love is. Watching her experience my own fear and grief secondhand has been really, really hard, and yet I am proud of her because she does not run from it ... there are missteps here and there, barriers erected out of self protection, but for the most part she fully embraces love in full knowledge. And she is only 21. All my children experienced this to some extent, but none as fully as Johnna because it was during my pregnancy with her that all the grief I had closed my heart to flooded in as I opened my heart to loving a new child. I recently saw a video of an ultrasound of a baby in utero clapping its hands in time to its parents singing. I have read that a baby's tastes in food are affected by what the mother eats before they are born. I know what raged through me when Johnna was inside me, and I have seen her from infancy learning to process these feelings she couldn't possibly have understood. Well, I am kind of babbling here. But I have stopped crying for now. Writing is good for that, but I need to move on to something more active now. Thank you for listening to me. And Michaela, wherever you are, I hope you can hear me too. I love you forever, baby girl. p.s. Here is the full post from Facebook, for those who need their tear ducts cleaned. My friend has a little baby boy, and I've also met him and held him. He's adorable. And this same friend's mother died in December. She gave birth to her baby couple of days befre New Year. She knows what it is like to lose someone so quickly and then creating a new life. I can personally be there for her and maybe help holding her baby while she has something else to do. Maybe her baby has some knowledge of grief as well because her loss of mom and baby's birth happened just within weeks. I can't really speak for myself here, but this friend of mine could actually relate to you, somehow. Different kind of losses of life, yet then creating a new one. I cried when I read this one. I actually cry for every sad thing I know of. But I think I should stop doing that if comes a time when I should be strong for someone else. Never have had to do that before, but now that I'm 20 I think I should "man up" a bit. You never know when you need dry eyes. In the end crying is okay, though. Thank you for that poem, Sharon! I'm just getting to the end of a trying week with my two energetic boys and I needed that poem! You really seem like an awsome mother...god bless you and your family...lots of Hugs..